Home / Nigeria / Sport / Where Did It Go Wrong For Nigerian Athletics? Where Did It Go Wrong For Nigerian Athletics? positive for a banned substance. In another competition, a video of the youth team competing at the IAAF World U20 Championships in Poland surfaced. In an interview with Athletics Africa, Godwin Ashien, a member of the U20s men's relay team lashed out at the lack of support from the administration. The Nigerian Women's 4x400 relay team will not compete in the 2016 Rio Games, after an athlete who tested positive for a banned substance was disqualified by the International Association of Athletics Federation. 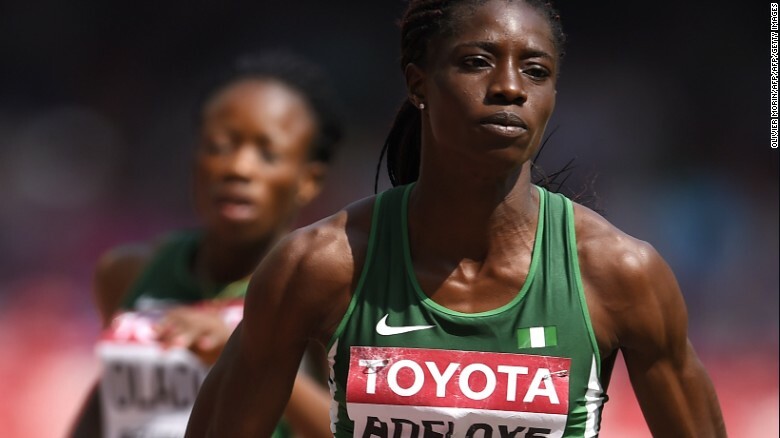 A spokesman confirmed to CNN that Cuba would now take Nigeria's place after athlete Tosin Adeloye tested positive for a banned substance. The news comes at the end of a tumultuous week in Nigerian athletics. First Nigerians were outraged to discover last week that some members of the national team had resorted to crowdfunding to pay for their flights to Rio, the result of an email from the Secretary General of the Athletics Federation of Nigeria which asked athletes to pay their own way and be reimbursed at a later date. One athlete who spoke to CNN on the condition of anonymity said she received a phone call from her Federation asking her to pay for her own flight. "It was a bit surprising, because I was [previously] told the Federation would pay for my flight." She said that with her repeated requests for a ticket ignored, she sourced funds independently. "I've been helped, people have really stepped in and helped. But without all that it wouldn't have been possible," she said. CNN spoke to the country's Minister for Youth and Sport, Solomon Dalong who promised that the athletes would be supported and their flights paid for. He denounced the original email, saying it was sent without his approval, but that through an internal investigation he discovered the practice of foreign-based athletes paying for their tickets and being reimbursed wasn't out of the ordinary. Dalong said: "I established [that] was an existing practice here. The one which I have queried is for the issuance of the email without authority, that was wrong. As for the content that is something they have been doing over the years. I even interviewed foreign based athletes and they confirmed it has been the practice." He confirmed that the Nigerian government had allocated $3.49 million for the Games and that the team would depart for Rio on Monday, just four days before the opening ceremony. "Nobody cares about us," he said. Right from Nigeria... down here... even coming from Nigeria to Dubai, we didn't eat for three days, we didn't eat." These incidents have left many wondering where it all went wrong for Nigerian athletics, but former Olympic athletes Chioma Ajunwa and Mary Onyali-Omagbemi say this decline has been a long time coming. Ajunwa, who won an Olympic gold medal in 1996, said that the "nonchalant attitude" of officials towards athletes was contributing to the nation's poor performance in competitions. Nigeria did not win a single medal at the London 2012 Olympic games. Dalong has said Team Nigeria is targeting 10 medals in Rio. Other nations have taken in their athletes for the past three years in order to make sure they can do a perfect job," said Ajunwa. "But our own [athletes], they're on their own, they train on their own, they pay their bills. It is inhuman, Nigerians should learn that." Ajunwa reflected on some of her own challenges as part of Team Nigeria, and the attitude of the administration that she says still lingers. "While I was competing, each time I have injury or anything I'm on my own," she said. "My country never took care of that, and that is why some of our athletes defected into another country. Nigeria will only want [you] when you're winning, they will like you when you're winning. The moment you're not winning they'll abandon you." Dalong, who was appointed in late 2015, said he could not comment on the behavior of past administrations but that he is committed to making the welfare of athletes a top priority. "What we have done now is to ensure that the welfare of the athletes is paramount," he said. "I am personally supervising the payment of their bonuses and their allowances.. It is our responsibility to cater for each athlete's welfare throughout the period of competition and returning them to wherever they are." As well as investing in the welfare of athletes, Onyali-Omagbemi says Nigerian athletics on a whole needs a revamp. "Sports development is the key of any athletics federation anywhere in the world," said the former sprinter and two-time Olympic bronze medallist. "If you don't have that youth/junior category that eventually metamorphosizes into the elite ... once that circle is broken, you create a void that could last years. That's exactly what happened to Nigerian athletics." Onyali, who worked as a special assistant to the past two director generals of the National Sports Commission, acknowledged, "things weren't always rosy" during her time as an athlete, but despite the difficulties there was some support for athletes. "The government was doing its part and the private sector were doing their part too," she said. "Somewhere along the line the private sector started pulling out gradually and completely pulled out. Right now we barely have a handful of the private sector supporting sport in Nigeria. That is what is hurting, that is what is really hurting us now." Dalong acknowledges existing problems but said that under his watch Nigerian sports will undergo total reform after the Games, one that is more private sector driven. "There's a committee that has been constituted for the past three months that will submit their report when we return from Rio, he said. "An entire overhaul of the sports architecture is what we have embarked on. This will go a long way in encouraging investment and opening the potential in sports development." Despite the challenges Onyali and Ajunwa are confident, that with the right structure, Nigeria has what it takes to become a powerhouse in athletics -- if the new administration makes the right preparations after Rio. "We're 170 million Nigerians and 70% of us are youth," said Onyali. "If we have stadiums, even if it's a six-lane track in every LGA [local government area] in Nigeria, there is no way we're not going to surpass the Jamaicans and the Americans put together in talent," she said. "Nigerians are very resilient. Four years [until the 2020 Olympics] may be short to develop an elite athlete, but I believe we can."